If Wasabi were the Publican and the menu encouraged me to send the kitchen a sixer of beer, we just might be able to get something going here. As it is, the cooks and sushi chefs at this three-month-old Japanese restaurant are dead tired, bored and/or just going through the motions without much of the care and attention it takes to create a notable sushi-yakitori-ramen-etc. joint. Sometimes they cut the flabby fish correctly; sometimes they don’t. Occasionally they’ll roll the maki tight enough to make it to the mouth intact, but not always. 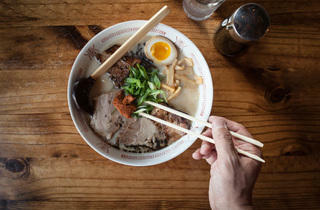 But almost across the board, they are simply putting out bad ramen, assembled from one-note broth and uninspired noodles. But there’s a little hope. In my adventures through this land mine, I’ve figured out that if you bring a bottle of chilled sake and order specific small plates and skewers, you can actually have a nice meal here. You’ll need to abandon the idea of eating a light, fresh, healthy Japanese dinner, though. Wasabi’s standouts are drinking foods—the stuff that comes straight from the fryer to your plate—that make that crisp sake essential. There are juicy chicken drumettes dusted in seasoned cornstarch and fried crisp, nubs of chicken skin threaded onto a skewer and turned into poultry CornNuts, soft Japanese sweet potato coated in crunchy panko and a genius fried spring roll that pairs luscious Berkshire belly with tart kimchi. And then there’s the one standout that doesn’t require continuous swigging to keep the food coma at bay: the yellowtail collar, kissed with salt, perfectly grilled and needing nothing more than a squeeze of lemon. Of course, when the best execution of fish in a sushi restaurant is a cooked scrap cut, the owners might want to think about recasting the concept. El stop: Blue to Logan Square. Bus info: 52, 56, 74. Trying ramen restaurants in Chicago is my new mission, and this is the 2nd one I've been to. The Logan Square location is off the beaten path and appears to be a hole in the wall type place that always has a wait. Luckily, we came early enough to be seated immediately. Try everything - it's worth it. We started with a few small plates and sushi roll (I ordered the spicy roasted garlic miso ramen). For dessert we had the espresso cheesecake and green tea mochi. Desert portions were small but just the right amount. Our only disappointment was no drink menu - it's BYOB so don't forget your drink! Otherwise, I was super impressed. You need to check out atleast one ramen restaurant for the presentation alone. FOMO is real at Wasabi. Do you get the sushi or the ramen?? Ahhh. Well, I say both. Split the sushi with someone to start and then get ramen for your main, OR split a bowl of ramen with someone you feel really comfortable slurping with. The Logan is probably my favorite maki and the spicy roasted garlic miso ramen is my preferred ramen dish. This place can get pretty busy, but it's worth the wait. Best ramen in the city! Hands down authentic And actually has good simple sushi rolls. There are oodles of places to get Japanese noodles in Chicago, but nobody makes a rich, slow-cooked pork broth like the folks at Wasabi. 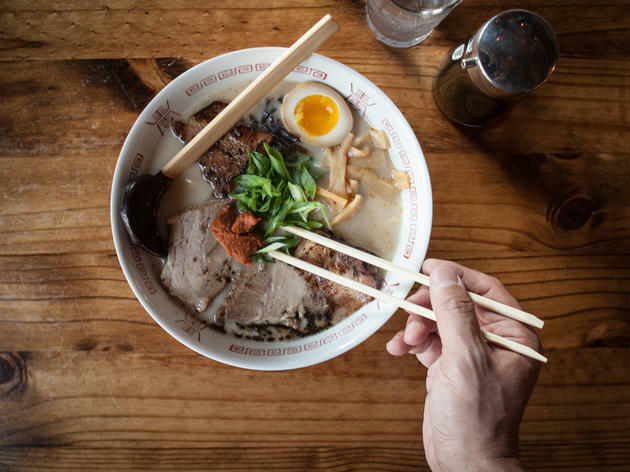 Start with the Tonkotsu Ramen, which is the best I've ever tried (though I haven't made it to Japan.... yet) which bathes tender pork belly in a meaty broth. The Spicy Roasted Garlic Miso Ramen is also excellent and will ensure that vampires don't come anywhere near you.